Gauntlet puts players into the role of four adventurers with unique abilities. They must come together to overcome evil, or stab each other in the back for the sake of loot. Dying and betrayal is all part of the fun, so check out the review to how this arcade classic reboot measures up. Gauntlet is about as straightforward as it gets when it comes to being a dungeon crawling RPG. You gather together with three other people, either locally or online (or a mix) to shoot, bash, and fireball a sea of monsters coming at you, all while collecting treasure along the way. But the game quickly progresses past its presentation, and much like a group of players coming together, becomes something greater. I strongly advise playing Gauntlet with at least one other person. This is the kind of game that comes to life when others are involved. Although it might be worthwhile to do an occasional solo run to hoard all the loot, it's kind of dull when going it alone. People are needed for a real party, and the more the better, because some of the bosses are very hard to beat. Up to four players come together to traverse the dungeons in search of action, loot and cooked turkeys. The four characters include (my favorite) the Elf, who specializes in ranged attacks and can drop explosives; the Warrior, who swings a big axe; the Valkyrie with a spear and shield (which can be thrown Captain America style) and the Wizard, who has a selection of different spells. Each character has a unique set of abilities to help mow down enemies, but it often seems like the melee characters often get the short end of the stick. Despite the ability to do more damage and take more hits, they're the ones that have to run headlong into combat, and consequently are usually the first ones to die. Dying is all part of the game, and caring friends will quickly loot your corpse of all the money you've dropped. 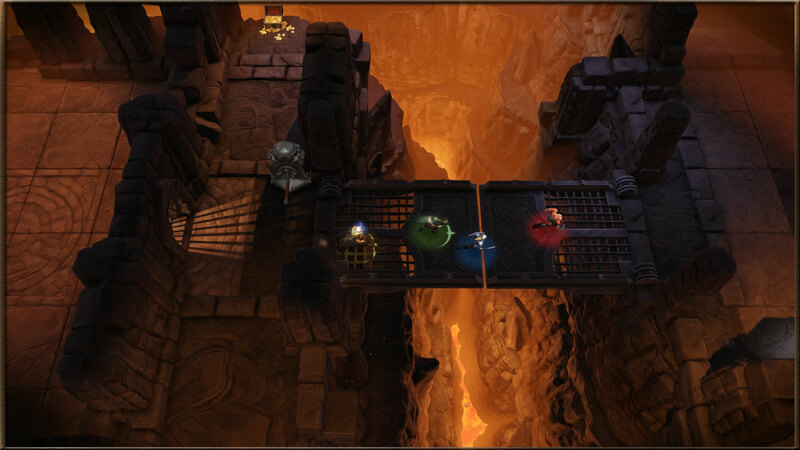 Although Gauntlet is technically a cooperative multiplayer game, there is a strong element of competition involved. 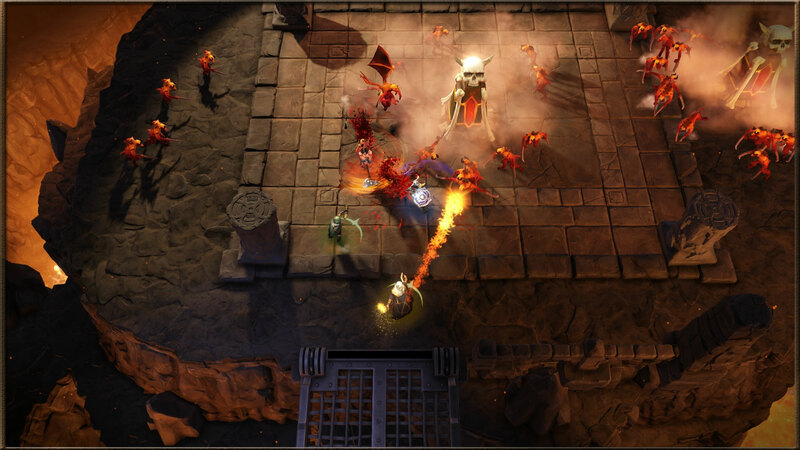 Players are mostly fighting to be the first to pick up gold, which can be used to purchase and upgrade Relics - objects that grant users special abilities like leaving a trail of fire behind you or creating duplicates. To this end, players try to race forward to grab up as much gold as they can, and some may take opportunities to let fellow players die so that they can grab up some extra gold. The mix of trollish and cooperative behavior is precisely what makes Gauntlet work so well, and to top it off, there are benefits to dying. By achieving milestones (killing X number of enemies, eating food, getting gold, etc. ), players unlock different abilities called Masteries. Masteries range from improved speed to more skills abilities like firing an explosive arrow, and there's a whole set of them that are unlocked by dying in numerous and various ways. So, in a way, your allies could be doing you a favor by betraying you. Masteries can be a bit tricky, since they unlock as soon as you hit a milestone, but you can't read up on how to use them. So, I often found myself saying, "Oh, I can do that now. How do I do that?" For example, the Elf has the ability to transform into a ball of light just before it dies so that it can relocate with one hit point. The Valkyrie gains a pair of glowing wings that probably relates to a reduced revival timer after dying. There's no way to know for sure what's happening or how it happens without reviewing the Masteries menu... and who wants to do that when a Gauntlet party is going on? Competition can also heat up over food, since (apart from specific Relics and Masteries) it's the most effective and direct way to regain health. However, a stray shot can destroy the food and make things harder for the group. On the bright side, destroying food unlocks a Mastery. The concept becomes more amusing during local games, since no matter who survives and gets the gold, it's the owner of the game that wins. Everyone playing locally levels up the host's characters, which is too bad. It would be nice to import my character to play in a couch co-op match. Gold can also be used to purchase new weapon styles and outfits, but these changes appear to be completely aesthetic. Although I realize that an armor system that provides gameplay bonuses might interfere with the Mastery and Relic systems that are already in place, a part of me can't help wishing that the rather expensive options did more than make my Elf look a little different. 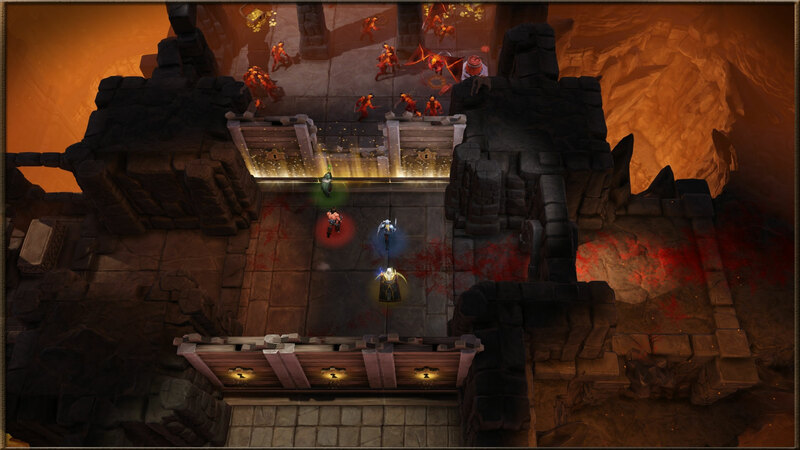 Gauntlet's dungeons are comprised of a mix between fixed areas and randomly generated pieces. So, replaying a stage has a sense of familiarity, but you can never be entirely sure how the map is laid out. The levels will also change if the entire team gets wiped out and is forced to restart. Nevertheless, the levels are linear, save for a number of secret areas scattered around, which keeps the game moving at a good pace. Special events, like Death materializing to chase you, helps to keep players on their toes. Especially when they have to make their way through traps while trying to outrun Death. Gameplay generally consists of moving from room-to-room and destroying all the monsters and summoning portals within. Like the original arcade Gauntlet, this reboot's concept hinges almost entirely on surviving against a horde of monsters before they can overwhelm you, and it works nicely. The game can be as easy or difficult as players make it, and I'm not just talking about the settings. Accidentally backing into a locked wall while holding a key will unleash a tide of enemies that adds to what you're already fighting. Some areas have trigger events that will bring up new summoning portals. Figuring out what to do and what not to do is part of the fun, but the game can become a bit exhausting when you have to keep track of everything that's going on. The main weakness of the game's design is in how the player cards, showing a character's health, inventory, and active ability, can block the action on the lower part of the screen. Getting trapped at the bottom of the screen is one of the worst things that can happen, since you can't see monsters that are hidden behind the game's interface. Gauntlet's online multiplayer can be a little hit or miss. I experienced games that held together without problem, and games where players lost connection midway through a dungeon. My main issue is with how players that lose connection and get dropped can't rejoin the game. 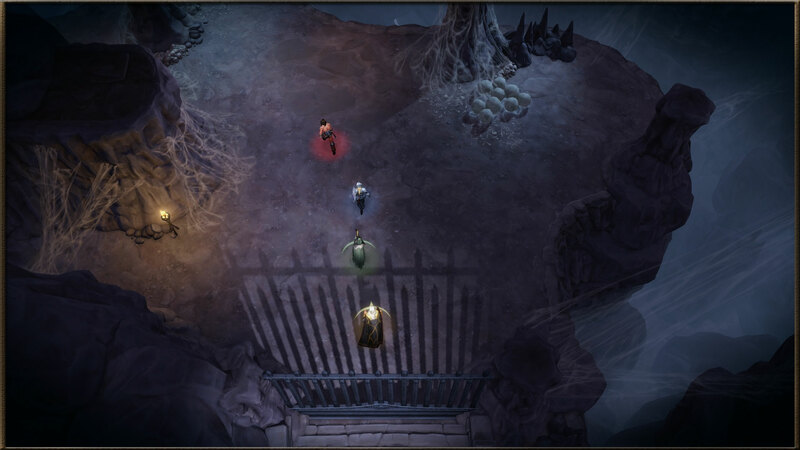 There are no drop-in/out options like you would find in other action role-playing games like Diablo 3. A party can only be formed in the lobby, which means completely leaving the game you're in. It would be significantly better if new players could join in the Hub, the pre-dungeon area where players shop for items before selecting the stage they want to enter. In the same vein, the game doesn't transfer to a new host if the active one loses connection or drops out. That might be the worst oversight, since players have to form a new party and restart a dungeon every time it happens. Gauntlet is the perfect party game. It brings people together while tearing them apart. There's fast action that's easy to pick up for more casual players, and a decent selection of relics for players that want to make to experiment with ways to make their character an unstoppable loot grabbing killing machine. The online component could do use some improvement, specifically with the ability to rejoin an ongoing game. Although it isn't as deep as other action role-playing games out there, its simplicity is a big part of its charm. It is the kind of game I find myself trying to talk my friends into playing so that we can confront the hordes, battle giant bosses, and fight over gold. This review is based on a downloadable PC code provided by the publisher. Gauntlet is available now on PC for $19.99. The game is rated M.
Steven Wong posted a new article, Gauntlet review: Quintessential dungeon crawling. So, now the question is do I get it for the PC or wait for the PS4 version. Decisions, decisions. Might even be free on the PS4. are they even making it for ps4? They have to port it right? Gauntlet is made for the console! "Coop" games are the best! I tried to hunt you down when you hoped on TeamSpeak but ended up joining pubby game. I like that you can't talk to other others besides the "Yes,No,Awesome,Boo" button. Hit me up on steam, I'm up for a game tonight as well! 2 zones on unfair? damn, i havent tried much solo, but based on the Hard setting i seriously doubt i could handle Unfair. what class did you use? Yeah I've had a couple bugs at the end of floors that have made me restart. I played a few hours last night with a friend. It's a good expansion on the original game. Typical angry tourist game-play, but with shared gold and limited shared lives you're less likely to hoard food if the other players need it. It's good coop fun, but I doubt I'll get a huge number of hours out of it. How is this with M+KB vs a gamepad? I have both but I was thinking of playing coop with the lady and she insists on M+KB. It's a little difficult with a m/k as you share the screen which makes the mouse/targeting move around you - this is what my friend said, before switching to a controller. after some quick playing with the M/KB controls just now, and after my brother giving me his opinion of the setup, i think they work quite well. slightly cumbersome for the wizard, at least when im so used to the diablo 3 controls, but i think the hang of it at least as fast as i did with the controller. as a bonus i think aiming directional abilities, is far easier with the mouse cursor (certainly for me, and id bet for nearly anyone). melee seemed slightly more awkward compared to the controller stick, but nothing a few minutes of practice wont cure. this was only with myself on the screen so i cant speak to how it might be affected by screen-sharing. LOVE THIS GAME! The combat just does something that other ARPG's didn't, so much fun!